Here we go again - for the 4th and final time this year, it's time to pack the car and drive off for an Ironman branded adventure (an Ironventure?). This was the one I'd always expected to be the A-race of the year, the one it was all building up to. It was to be my first full distance race, that is before the Ultimate Challenge was announced by Ironman and I signed up for another two races. Mrs created a page for us, you can find it at Ironman Ultimate Challenge, on Facebook. I always expected Ironman Wales to be the toughest one of the four. 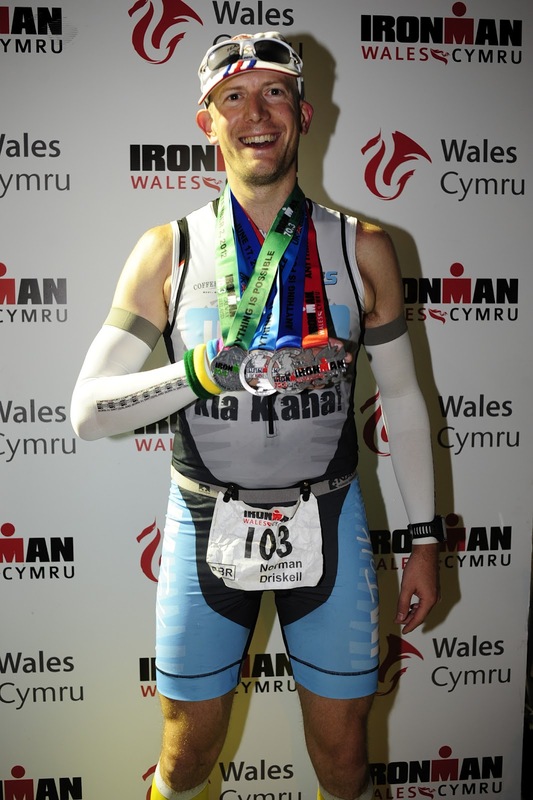 It had been commonplace to suffix "Ironman Wales" with "the toughest Ironman in the World" and some of that repetition was starting to hit home. I was genuinely concerned about the bike phase and if I'd make the cut-off. Mrs and I had been down to ride at the course twice in recent months, and even a lap of the first loop (the bigger of the two) was taking us about 5 hours. Further stress was as a result of the lead-in to the race being less than ideal. 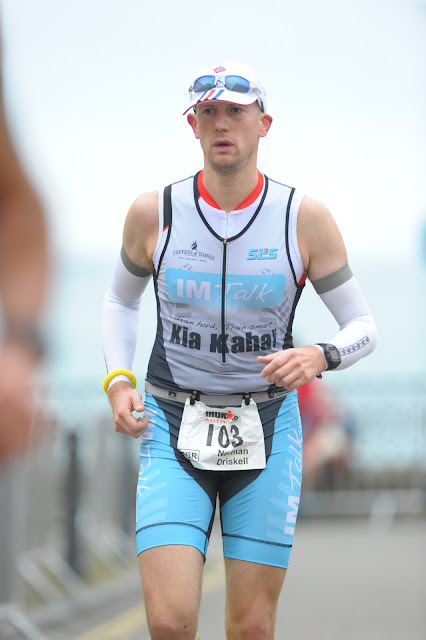 You'll remember that Mrs had a "bit of an off" during Ironman 70.3 Galway a fortnight ago. She broke her collar bone spectacularly and was in a fair amount of discomfort. To our delight the NHS had agreed to her desire to have the bone plated, and there was even a slot available for the surgery. The procedure was completed on the morning of Thursday 13th, the day we had planned to spend packing. This wasn't too much of a problem as Mrs packed on Wednesday, and I packed while she was in hospital. Despite the operation being booked for 9am, I still hadn't heard anything by 3pm and decided to go and see if I could find her. She spent quite a while in the post-op ward coming round from the anaesthetic and waiting for a bed to become free on a recovery ward. Eventually I caught up with her at a bit before 5pm, and it became rapidly clear she wasn't going to be let home that day. The operation was a complete success, but she was weak and the Doctors wanted to run a few tests. This meant we couldn't get the planned early Friday start - in fact we didn't leave until about 3:30pm. Regular stops to walk about, plus the horrors of Friday traffic on the M25, meant that we didn't get to Tenby until gone 10pm. Another long day, and not much sleep for quite a few days in a row now. Not the ideal preparation. I was a bit stressed and tired, so polished off my Friday with a couple of pints of Beck's Vier - the relaxation was long overdue, and a couple of medicinal pints now were hardly going to impact my performance. It felt good to finally be back in Tenby, to be gearing up for the big race of the year. Saturday was quite busy. I'd had no exercise for the last 48 hours and was due a short run before breakfast, just to make sure I could remember how to put one foot in front of the other. 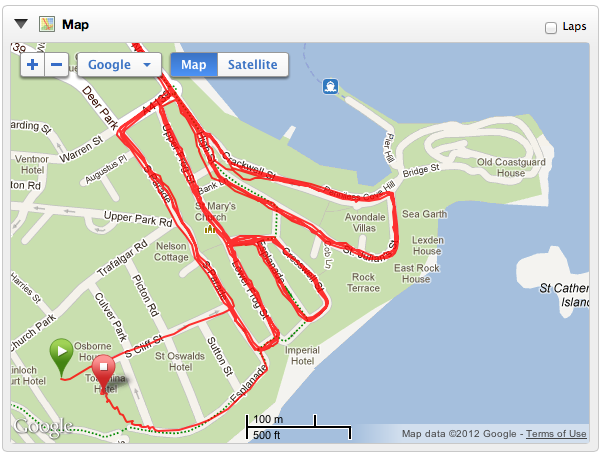 I ran through the town and across to North Beach to check out the scene of tomorrow's race. On my way back I bumped into Ultimate Challengers Kate and Charlie Stannett having a heated discussion about where the run course goes. Kate and Charlie are seasoned Ironman competitors, with Charlie having competed in the inaugural Ironman 70.3 World Championships and Kate having competed at the Ironman World Championships in Kona, Hawaii. We first met them in June at Ironman 70.3 UK in Wimbleball, and their easy confidence has helped both me and Mrs grow through the year, and they are credited as the inspiration for the Ultimate Challenge. It felt good to bump into them, it made it feel a lot more like a race weekend. Previously it felt a bit weird, as it was to be the first Ironman race without Mrs on the start line, but now I was starting to get excited. Having been here as a volunteer last year I knew the layout. Transition and the expo were in the same place, and our hotel, The Giltar, was right on the finish line. I popped over to register and then headed back to the hotel to pack my blue and red transition bags. Despite my enormous list of Things To Take To An Ironman Race (which has evolved further since I posted wrote it), I find I haven't made a list of what to put in the transition bags. I got a little stressed trying to visualise the transition process and make sure I had everything I needed. It looked about right, let's get on with it! I put my wheels on my bike (you're in trouble if you forget those), attached my gels, checked the tyre pressures, and headed back to transition to rack and drop off my bags. Having everything close to hand is so much easier. This process alone took half a day at Bolton what with driving around the various venues and getting stuck in traffic jams. Much less stressful here. We managed a couple of hours rest in the afternoon, and then it was over to North Beach for a quick swim. The sea was lovely - warm and calm, nothing like it was a few weeks ago when we popped over for course reconnaissance. On that weekend the waves were so big as you crested them the next swim stroke was completely out of the water and then you fell forwards about 5 feet, plunging into the next wave. It was very exciting and a bit scary, and would have been a real pain if we'd had to complete 3.8km in it. Thankfully, nothing like that, and I did a quick 10 minute lap of Goskar Rock, the large rock in the middle of the bay. Everything was working well - wetsuit felt comfy, nose clip and neoprene hat were perfect, mirrored/polarised goggles were clean and clear. I felt ready for race day. I popped into the Race Briefing to see if there was anything new (there wasn't), and then it was back to the hotel. After dosing up on white bread and spaghetti bolognese it was time for bed. Again I had no problems sleeping, I'm really pleased I can relax and sleep ahead of a race. I know that a poor sleep the night before doesn't really affect your performance, but that depends on having had a good few nights previously, and I was barely managing 7 hours for most of the week. Race morning arrived and I was up at 4:30am. Another nice side effect of everything being in the same place was no need for a really crazy early start - a far cry from the 3am alarm I had for Ironman UK in Bolton! We've got race day morning's sorted now, and Mrs helped me with my preparations. Over to transition to pop my solid food filled bento box onto the bike, wetsuit on, and I was ready. Female professional Eimear Mullan was running around looking for elastic bands. She had a last minute mechanical at Ireland, and had needed new pedals here in Wales - she doesn't have much race morning luck! It doesn't seem to impact her performance too much, she won Ironman 70.3 UK and Ironman UK, and came second in Ironman 70.3 Ireland. Sorry I didn't have any elastic bands for you, Eimear! We were held in a waiting area ready to be marched across town in a great black rubbery procession. I was right at the front. I fidgeted. Although I'd used the toilet when I got up I needed to go again, I decided that it was too late and I'd have to hold it for now. I'd regret that decision later on - twice, in fact. As it was we were held for what felt like about 20 minutes before finally making our way across. There was plenty of nervous banter in the group. "Is this your first time? ", "How much training have you done?" etc. I must appear quite stand-offish in these situations as I don't really want to get involved in these conversations. I prefer to remain centred and settled, thinking about the task ahead. There's no point talking about training now, or joking about what's going to go wrong or how crap you are! I try to stay away from the negativity. We were paraded through town to polite early-morning applause, it's a big ask for enthusiasm at 6:15am, but the assembled friends, family, and locals were trying bravely. As there is the same 1 km to go back to transition after the swim exit, we are permitted an extra pair of shoes to put into a yellow carrier bag. An additional set of transition hooks are provided on the ramp up from the beach. My previously mentioned girly feet would be very glad of this. I'd elected to include a pair of socks too so I make sure I don't catch my big toe nail on the inside of my shoe. The toe got very bruised in Bolton 7 weeks ago, and the left side has become detached. It's still held firmly in place on the right side, but the last thing i want is a stupid mistake at the start where I end up tearing it off - I'm convinced that would result in untold pain and a DNF for certain. We were allowed some time to warm up to the left of Goskar Rock - I was very grateful for this. As I've said previously, I need to introduce myself to the water gently or I end up freaking out and getting very stressed. I get over it in a few minutes, but it's not the best way to start a race. I was right at the front of the procession, and one of the first down onto the beach, and so had a good 10-15 minutes to spend bobbing around and swimming up and down with no pressure or others in close proximity. It did wonders to settle any remaining nerves and get me acclimatised. I felt good, let's get going! This was to be my first beach start - running down into the water across the sand, doing little jumps over the small breakers like you're competing in the mini-hurdles, and then diving full length into the foam to strike out hard towards the first buoy - it would almost be a crime not to film it and play it back in slow motion with some powerful "male grooming products" style soundtrack over the top (you're a man! You're the BEST!). That's the theory, that's what was in my head (apart from the soundtrack), but it's not quite what happened. I was hoping to get a good strong start so I positioned myself right at the front. The professionals were held in front of us. They'd been told they were going to have a 30m head start, but they were barely 10m in front, and with everyone edging forwards unstoppably it was more like 5m by the time we were ready to be started. They tried to stay ahead and ended up walking into the water, so their beach start wasn't a beach start at all, more of a thigh-high water start, a no-mans land of neither beach nor deep-water start. I looked behind me at the hundreds upon hundreds of heads. I know I'm not the fastest swimmer, but I'm used to getting swum over a fair bit so I should be OK. I wasn't. The gun sounded and we ran forward. It's all a complete blur, and I really don't remember much of the first couple of minutes in the water. I think I tried to dive in and start swimming too early, all around me were arms and legs and bodies pushing me down and into the thrashing foam. My nose clip got knocked off almost immediately and I took a few hard punches to the head, one right on my right goggle-eye that left me a bit disoriented. I took in at least three big gulps of sea water as I struggled to find air to breathe. This went on, and on, and on - the battering was relentless as I lost dozens and dozens of places. It's the only time I've been genuinely scared for my safety in a race situation. I couldn't breathe, my arms and legs had instantly filled with so much lactic acid I could hardly move them, and I couldn't keep my head above the water - I wish my heart rate monitor worked in water as I'd love to see how high I went, the thumping in my ears was so loud and fast it sounded like a continuous tone. As if that wasn't bad enough, I started to realise I was relaxing bits of my body that really shouldn't be relaxed in a wetsuit (the first of the two times I would regret not making that final visit to the bathroom), and had to clench hard to avoid extreme embarrassment. I'm in the middle here somewhere, fearing for my life! I seriously considered stopping right there and then, but there was no way to do so - when you're in trouble in the swim you should float on your back with your arm in the air, but there would be no chance of being seen and I'd just have got mown down by the whole rest of the pack, so I had to go onwards. I thrashed and panicked my way to the first turn buoy and worked my way round to the far side, in the shadow of the route and out of the way of the never ending stream of swimmers. I clung hard onto the kayak of one of the swim safety marshals and tried to regain my composure. I was soon joined by another swimmer who looked pretty beaten up as well. "Are you guys OK? It looks brutal out there!" asked the marshal. I said I was, I just needed a few minutes to get myself back together and try and relax. My pulse thumped in my ears, and the continuing panic made it hard to think straight. I hung on for a while and felt my arms and legs come back and my breathing start to relax. There's no way I can stop now, I have to go on and complete the Ultimate Challenge. I reassured myself that the discomfort would be temporary, I'd be out and on the bike before long, and could forget about the swim. I looked around for the next buoy and steeled myself to start swimming again. After a major freak out I find it very hard to get my rhythm and become comfortable. I can't get my head properly in the water - it takes a good few minutes before I stop making exaggerated head turns to breathe. I got beaten up a bit at the next turn buoy (but nothing like the start) and I needed to tread water on the inside of the turn in order to keep my head above water. I only really started to settle down during the long stretch parallel to the beach. I started reeling people in and overtaking them as I got more and more relaxed, and soon found myself coming to the end of the lap. A short trot across the beach and it was back in for lap number two. There wasn't much congestion getting back in, and I went slightly to one side to get some clear water. Much better. The first turn buoy came up in just a minute or two - I was amazed at how close it was, it felt like it took an age to get there on the first lap. No hanging on to kayaks this time; a swift left turn and I was off and and on my way. A much less eventful second lap, thankfully. I'd fallen into my usual rhythm which, although not as fast as I can swim, was clearly going to get me to the end of the swim with the minimum of fuss, and after the "fun" of the start that's all I was looking to achieve now. Exiting the water I checked my watch and was somewhat amazed to see 1:09 - that's 6 minutes faster than at Ironman UK, and an average (not including the beach trot) of 1 minute and 49 seconds per 100m. Now there's no way I can sustain sub 1:50 for 3.8km, and with my major problems at the start and the jog on the beach to account for, that meant it would have to have been faster than even that pace. This means one of two things, either a nice favourable current across the long stretch while we were parallel to the beach, or the course was short. In any case, I was out in 1:09 and the swim was behind me. My Garmin measured the swim at 3.59km in 1:09:22 - taking off 30s for the beach run, and a conservative 30s hanging onto the kayak, that makes 1:08:22 for 3,590m which gives an average of 1:54/100m which is about spot on, and averages very slightly faster than the 1:55/100m I swam at Bolton (in much better conditions). Therefore I think the course was a couple of hundred metres short. But believe me, I'm not complaining! It's clear from my swim stats that I performed poorly compared to expectations (top 1/3 in the swim or higher). I think my finishing position is a fair reflection of the experience! My yellow bag was easy to find, there are some advantages to being number 103, and within a few seconds my socks and shoes were on. I had planned on a brisk walk across town to transition to get my heart rate under control, it always spikes after the swim and when I set off on the bike, but the crowd were so active and vocal I found myself drawn into jogging along with everyone else. It was here we got our first taste of the level of support that would be with us all day. Every inch of the kilometre back to transition was lined with people, 3 or 4 deep in some places, and the shouting and cheering and relentless cowbelling was deafening. It was amazing! I've never been on the receiving end of anything like it. My good friends Rachel and Simon had come down to support for the day, and they along with my Mum and Mrs were cheering away - they'd seen me come out of the swim, but I hadn't spotted them. T1 was uneventful. I was very careful to make sure my feet were dry, and applied a liberal smearing of liquid chamois elsewhere to protect from what I'll delicately refer to as "intimate chafing". 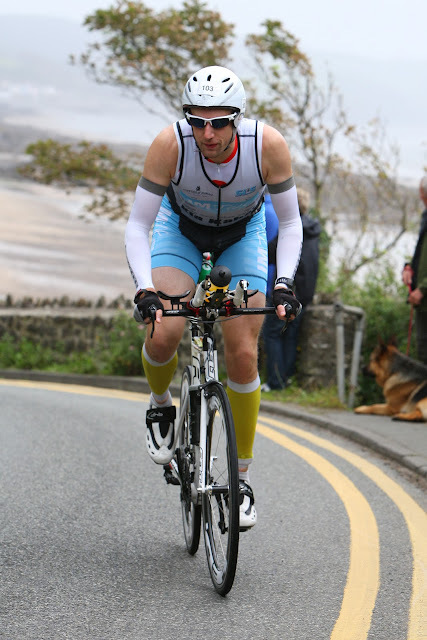 I lost a few minutes at Bolton trying to get arm warmers and my cycling top over wet skin, so this time I wore arm warmers under my wetsuit and all my nutrition was on the bike already so no need for a second top. 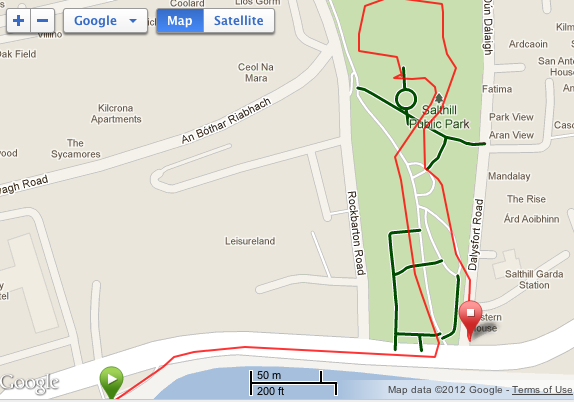 There was only one way to run to fetch the bike and leave T1 so none of the orientation problems I had at Galway. Apart from a near pile-up as the guys in front ran over the mount line and then instantly stopped and faffed trying to get onto their bikes and blocking the entire road in the process, I was through cleanly and accelerated off up the road for the 112 mile ride. I looked forward to the next phase and put the swim far out of my mind. After my fast and enjoyable ride at Galway where I learned the value of pacing and holding back, I aimed to take all of that into this race. I set off at a moderate pace, comfortable on my tri-bars, and not putting too much power down. The first of the three passes through Lamphey came up quickly. This was where the course split out on the first lap with an extra loop. I turned left and set off out to Angle. The ride out to Angle is relatively flat with just one slow hill coming out of Pembroke - it's not overly steep but is quite long. The rest of the route is undulating to say the least with little to no flat at all, and one or two exposed areas where we'd been warned about headwinds. I started to get quite a level of discomfort about an hour in. I often have some "wind" to expel after the swim, though that's much less of a problem now than it used to be (I ended up crippled over in pain at the Virgin Active London Triathlon a couple of years ago). I put it down to how I breathe in the water, and can only assume I'm getting better at making sure the air goes into my lungs and not my stomach (though massive under-water burps are hilarious and pleasing distraction in a long swim). With a little adjustment in position on the bike (and some good core muscle control) the air can normally be released without much of a problem, but after a few minutes of that it was clear that this was a bigger deal. I really began to curse not making that bathroom trip earlier, life was getting very uncomfortable! The first feed station was at Angle, the Westerly tip of the course and there are usually portable toilets at the feed stations. After clenching for dear life on the last 5km into Angle I was overjoyed to find a toilet. All I'll say about the experience is: 1) I've never been so happy to find a full roll of toilet paper in a portaloo; 2) local seismologists will be puzzling for decades over the unexpected tectonic activity they picked up on that chilly September morning. Moving swiftly on...! I felt relaxed and comfortable now, and slowly started picking off the places I'd lost while I was stopped. Having some familiarity with the course was a real bonus, I knew when I could open up and take full advantage of a downhill, and when I needed to push a bit harder to get some momentum up the other side. On a few occasions I flew past groups who were struggling up a hill as they hadn't known it was there, and had failed to use the preceding downhill to maximum effect. Just like at Bolton and Wimbleball, I was grateful for the time we'd spent on reconnaissance. I worked my way through Pembroke which had an odd little out and back section in the town centre, and back to Lamphey for the second time. Straight on this time, and onto what is in my opinion the hardest section of the course, up to Narberth. There are steeper hills on the course, but I find this part quite relentless in the long gentle climbs. This section is more sparsely populated and in some places there's not much to look at either, so it's mentally quite tiring. I found a good gear and settled in, chewing up the miles. I still felt strong, I was keeping on target with solid nutrition, a little behind on fluids but nothing to worry about too much. In one town there was a young boy by the side of the road in Templeton, a mile or two before Narberth, shouting out everyone's positions - thanks kid, nice touch! He said I was in 599th place. I'm happy enough with that! Before long I reached Narberth and one of the recognised challenging climbs on the course. It's a tough steep climb into the village, and I could hear the cheering before I'd even rounded the corner and come into view. The support was phenomenal, hundreds of people were out in this small town all shouting and waving. Pubs had their doors wide open and music on full blast - there was a real carnival atmosphere. It was incredible. You can't help but dig a bit deeper, turn the pedals a bit quicker, and make an effort to look strong and smile. I've never been in an event that's had this kind of competitor support form the locals, the other Ironman races were good but this was really a step beyond. Thank you, Narberth. Passing through Narberth is a big psychological step, it means there's only around 20km left on the lap, and that shouldn't take too long. The hills came and went until the next area of massive support, and that was Saundersfoot, and in particular what was considered to be the hardest hill on the course coming up from almost sea level right up onto the coastal cliff. I praised my decision to fit a compact (34/50) crank onto my bike. It normally has a road crank (39/53) and I think that would have killed my legs. With amazing crowd support, and more than a few wheel-spins, I pushed up the hill and made a few places in the process. 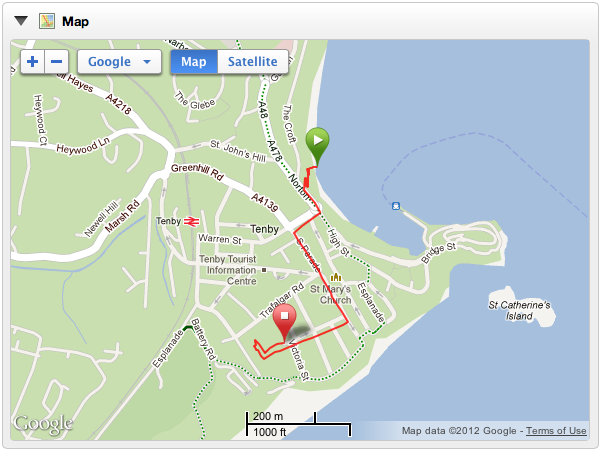 Before long I swept down into Tenby, shot across the small double roundabout, and was off on the second and shorter lap. I checked my watch, just over four hours and I was about 110km in. The test rides we'd done had taken five hours to go this far, so I was making good time. The second lap was plagued by squalls of cold rain, drops like needles stinging my exposed shoulders and arm pits. The going was definitely tougher. I took the descents a lot more carefully, and around half way round needed to take my glasses off as they were covered with crap from the road and had steamed up. I spent a lot of time riding on the hoods now rather than the tri-bars - partly as I wanted to be nearer the brakes, and partly fatigue. It's at around this time, five to six hours in, that my lack of deep base fitness and very long bike rides on my tri-bike start to have an impact. I'm just not used to riding for this long, and certainly not used to holding an aero position on the bike for this long. Sitting up is slower, less aerodynamic, and less efficient but the change in position makes it easier to stretch out your legs and back and certainly helps comfort. 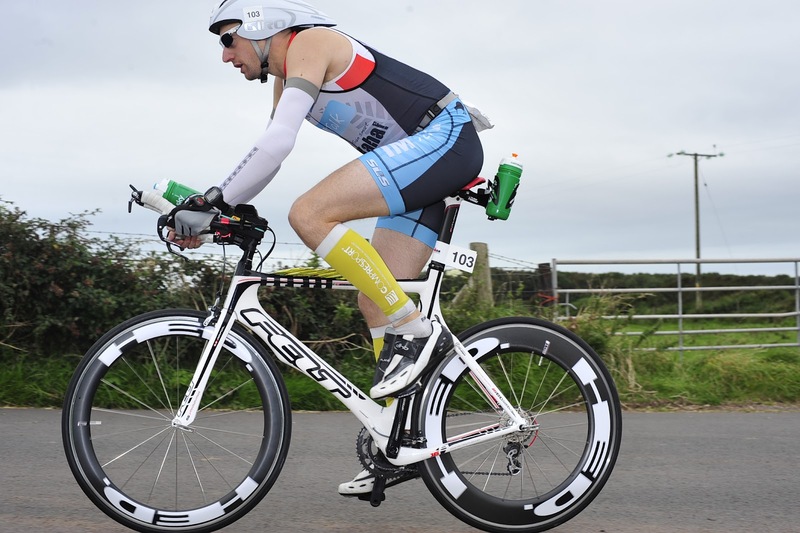 Before I take on a long course race again I need to make sure I'm comfortable over six hours or more on my tri-bike. I was overtaken by a few local ambiwlans (ambulances) and soon came across a number of crashes at the bottom of steep hills. Maybe they made a bad wheel/brake choice for the conditions, or just overcooked it. It pays to be a bit cautious when the weather turns and there's still a lot of race left. A fair amount less support in Narberth the second time due to the cold and rain, but those that were still out were highly vocal and again made a big difference to all the athletes. I managed to keep it shiny-side-up and got back to Tenby in one piece, rolling in to T2 after a bit over 7 hours. I was expecting to come in somewhere between 7 and 8 hours, and despite having slowed considerably over the last 40km I was still in the pleasing end of the bracket so I shouldn't complain too much. Unlike the guy behind me, I managed to dismount both before the line, and without falling off. I'd managed to avoid thrashing my legs too much (as can clearly be seen by not even getting into the top half on the bike), and I felt like I had saved some good effort for the run. T2 at Ironman UK in Bolton had taken an age. I needed the time to recover mentally after a tiring and poorly managed ride and spent time applying sun cream, using the toilet, eating a bagel I'd put in my bag, and all manner of other things. All important at the time, but not ideal if you're in a hurry. I didn't feel the need to do all that this time, I felt good and wanted to get out onto the run. My feet were dripping wet and I was monumentally grateful for having put a small towel and spare socks (with talcum powder in) in my run bag. I'd had spare socks in every race, and had never changed them until today. I took the time to make sure my feet were properly dry - the last thing I wanted was a blister-plagued marathon. I slipped on my wonderfully light Brooks T7 Racers, and ran out of transition and off for the final leg of the race. The run was four laps and consisted of two main sections. 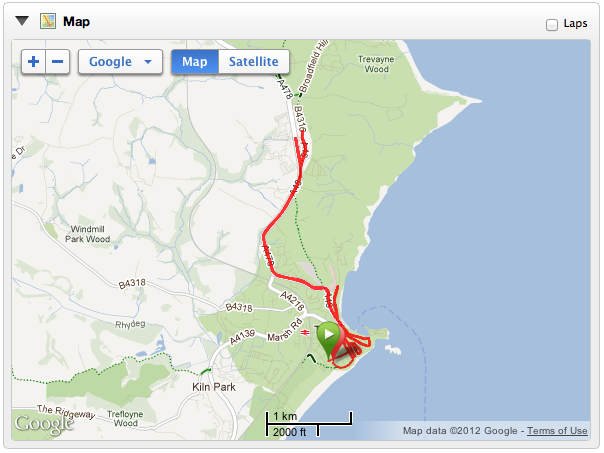 At the start of the lap you're directed out of Tenby for an out-and-back section. This is a long uphill of maybe 3-4km, a dead turn at the end, and a long downhill back with a wibbly bit along the way to collect your lap-marker arm band. Once back in town the course winds tightly around the centre with several narrow parts, right angled turns and absolutely no flat whatsoever. Just like the bike, I don't think there's a single flat spot on the whole run course. I felt strong and set off at high cadence and good pace. I caught a glimpse of my Father-in-law as I left transition and tried to wave, hopefully he saw. Both of Mrs' parents had come down for a few days; it really was nice that people had made such an effort to come and lend their support. Just like at Bolton it made a big difference knowing there were some close family and friends out there rooting for you. I'd followed my nutrition plan to the letter and therefore, as had worked in previous races, I would eat and drink as and when I felt like it on the run. My first kilometre was a bit fast at just under 6 minutes, so I backed off and settled in to 6-6:30/km. I held this pace for the first few laps. The crowd support was outrageous - cheering, clapping, cowbelling, all sorts of kitchen objects being hit with kitchen implements, it was a truly amazing experience. Thank you so much Pembrokeshire for coming out in such force. I caught sight of my Mum at the end of my second lap and gave her a quick hug (longer than intended, she wouldn't let go! ), and then spotted Simon and Rachel across the other side so they got hugged too. Another friend, James, had also come to support so I zigged and zagged my way back across and he too was hugged. No supporter to be left un-hugged! Already there were athletes who had finished and checked their stuff out of transition walking their bikes home or to wherever they were staying. They looked like they finished hours ago! I cursed them in a good natured way. Such parading of superior athletic ability shouldn't be allowed when the rest of us are still out here! My Garmin Forerunner 910 XT was behaving perfectly today, and at the end of the second lap I let myself check my overall time. I had no plans to hit a certain time today, it was all about getting to the end and completing the Ultimate Challenge, and so I hadn't thought about what a suitable finishing time might be. However, with the closing stages of the race ahead I allowed my thoughts to turn to what final time I might achieve, and if it could be quicker than the 13:17:45 I'd clocked at Ironman UK. My watch said 11:48 elapsed, that meant I had 2:29 to run the 20km of the final two laps if I was going to PB. On any other day it would be no problem, but this was the last 20km of a 225km race, so anything could happen. I held a reasonable pace for the third lap and completed it in 1:12, leaving 1:17 for the fourth and final lap. Thoughts of a PB drifted away as the fourth lap unfolded and I got slower and slower. I suffered from some pain in first my left knee, and then my right. I kept my cadence up, above 85, but just couldn't find the pace. I dropped to around 7:30-8:00/km. I was pleased that I didn't walk (apart from one tiny steep downhill that I didn't think my knees could handle running down), that was a big psychological victory over Bolton where I did a considerable amount of walking. My spirits were kept up by a couple of American athletes who recognised my IM Talk tri-suit, and again by the fantastic support form the crowd and marshals. Special mention must go to the group of young girls at The Croft who were marshalling the dead turn point there, they were relentless in their incredibly loud and motivating support for each and every weary athlete - amazing work, the volunteers were all just brilliant! Iron rusts, Ironmen don't; Train hard, train smart; Kia-kaha! I finally got to the end of the lap and was able to turn left down to the finish. Father-in-law thrust a big union jack flag into my hand, and I held it over my head as I ran down the finishing chute. 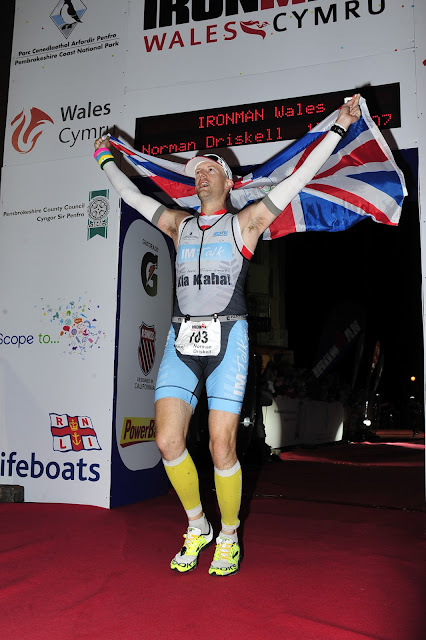 Ironman MC Paul Kaye shouted out that I'd now completed all four UK and Ireland Ironman events, and that I, Norman Driskell, was an Ultimate Ironman! The run was slow, but the primary objective had been met - and that was to finish the race. Mrs, who was gutted at not being able to compete, having had a plate put in her shoulder just a few days ago following her bike crash at Ironman 70.3 Ireland, had spent most of the day volunteering at the finish line handing out medals. She was waiting for me there with all four of my 2012 Ironman finishers' medals, and placed them all over my head together. Perfect! The Mayor of Tenby, councillor Trevor Hallett, deserves a big mention too, by all accounts he was there to award medals to the first finishers, and then stayed all day and handed out the finishers' medal to almost every other athlete. He looked to be thoroughly enjoying himself, and tried to give me another finishers' medal after I'd already got mine from Mrs! It was the best possible way to end the race, and I'm so happy and proud of her still being a big part of the day, giving up her time to contribute and help out when so many others would have spent the days after a big operation in the house complaining about how unfair it all was. Yes, it isn't fair that she couldn't finish the Ultimate Challenge, but I think she's embodied the Ultimate Ironman spirit more than any of us, and it's given us a great set of stories to tell round the campfire in the future. I needed some help walking, so leaned heavily on Mrs as I went through to post-race food, collected my white bag, and then picked up my blue and red bags and bike from transition. Again I reflected on how much simpler it was when everything was in the same place. Check out all the metalwork! The next morning we were kindly given a lift over to the awards ceremony by my parents-in-law. I don't know why a venue couldn't be found in Tenby, but as it was we needed to drive out to Carew Airfield. There were some refreshments laid on, and Paul Kaye got proceedings under way in his usual up-beat style. He announced the pro winners, age group winners, and then a special category for those successfully completing the Ultimate Challenge. The times the pros had put in were astounding on this course, including quite a few sub-3 hour run times not just from the pros but from the leading age group athletes too. It's also worth noting that Eimear Mullan completed all four UK and Ireland Ironman races too, but was not one of the Ultimate Challenge crew as she hadn't signed up for all four races up front at the start of the season. Successful Ultimate Challenge finishers were given a t-shirt and jacket, and a glass commemorative photo frame engraved with the four races and the year. Getting up on stage as an ultimate finisher was a high point of the whole experience and what the year had been about for me. I was so proud to be there, the only way it could have been better is if Mrs was by my side - but she got a big mention in the lead up to our awards, and a round of applause for her heroic performance in Ireland. After another day in Tenby we headed over to Newbridge-on-Usk for a week of relaxation, beer, and far too much food. That's where I am now, enjoying my last few days before going back to the real world on Monday. At Terry M at the Celtic Manor Resort, proof that Ironmans own more than just lycra! 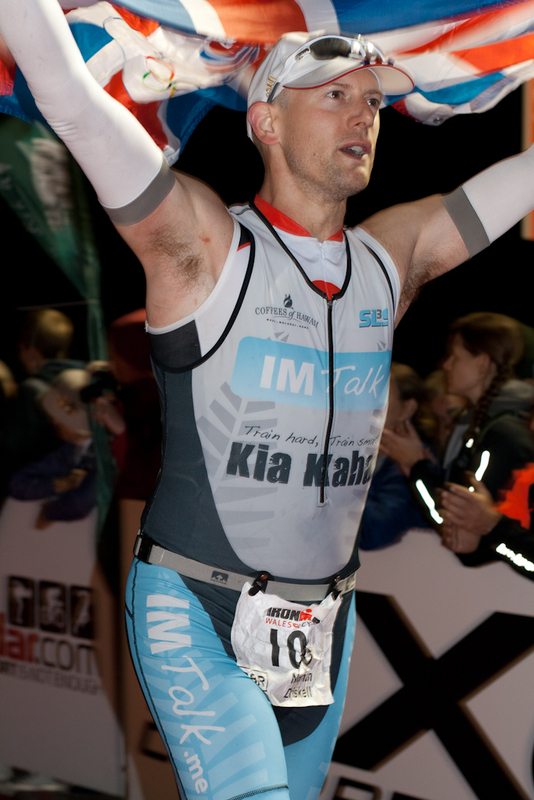 Ironman 70.3 Ireland, Galway: Part 2 - Race Day! We have race day morning well drilled now. Having been left high and dry previously, and needing to find random pastries and things to eat, we now make sure we are capable of being self sufficient. This means the morning routine is as follows: Up three hours before race start, kettle on, get dressed, make tea, re-boil kettle for ready break with banana in it and add peanut butter (or Nutella for Mrs). Whilst kettle is re-boiling, make protein shake with milk and drink that. By the time Ready Brek has cooled from lava-hot to edible-warm, we're virtually ready to walk out the door. We were staying at The Sea Breeze Lodge, only a 15 minute walk from race start, much better than the half hour drive we had at Bolton. We gave ourselves a cheeky lie-in, so up at 04:30 for a 7am start. We wanted to be there at 6am to put our bottles on the bikes and get down to the start area, so that meant leaving at oh-five-thirty (including contingency time for anything unexpected). There were no unexpecteds so we set off on plan. We bumped into a few of the other Ultimate Athletes in transition performing last-minute bike checks. Eimear Mullan was racked opposite us so there was a TV camera there following her every move. Eimear won the Female Pro race at Ironman 70.3 UK Wimbleball and Ironman UK Bolton, and was a hot favourite with plenty of local support here in her home race. It was a 10 minute stroll back down the promenade to swim start, so we sauntered down in good time. The great thing about having a plan and following it is that race day morning is a very relaxed affair. You can take the time to focus on the race plan and get in the right place mentally without panicking about if you've remembered your goggles or your bike tyres are adequately inflated. The swim start was in waves, with the male and female professionals setting off on the dot of 7am, the M18-24 age group at 7:05, all the males 25-39 at 7:20, and Mrs setting off with all the females and the oldest male age groups at 7:35. I was a bit more colourful than usual - it was my first outing in my shiny IM Talk tri-suit, I had my customary yellow Compressport calf guards on, and the previous day I'd got a bit concerned about the temperature and - determined to have a quick transition and not have to mess about putting a cycling top on - I picked up some Compressport arm sleeves from the "expo". For now, all this was safely tucked away under my wetsuit, so I looked like one of the dozens of unidentifiable men in black wetsuits with goggles and blue swimming caps on. I'm unique! Just like everyone else! I swam out to the start pen (no running into the sea start, disappointingly - I think Wales has a run-in though, I'm looking forward to that) and bobbed about. I didn't suffer any anxiety or 'freaking out' (sudden racing pulse, some hyperventilation) that I've had before. Now I've had a few good starts like this I'm hoping my open-water freak-outs are a thing of the past. The quietest hooter in the world was sounded, and we were go! First target was the nearest big orange buoy. When the pros went off some of them got the wrong target and headed off to a yellow buoy that was further afield - later one of them was to blog about it being due to a lack of clarity in the pro briefing. For the last few waves they had gone out in a boat and deflated it to avoid any further confusion. No such problems for us though, and I set off hard and, for once, in a straight line. The sea was very calm, granted there were some waves that were bigger than I've had in lake swims, but they were completely manageable and hardly impacted my ability to swim or sight. I think we were lucky, the weather had been bad overnight, and the sea was certainly rougher during swim practice the day before. As a result of trying to set off hard I ended up in the washing machine for longer than usual. Right up to the first buoy, and for the first half of the long straight parallel to the shore I had people all around me - fingers tapping at my toes and ankles, arms around my head, my hands banging the guy in front, and shoulder to shoulder with someone next to me who was matching my speed and cadence perfectly (except he was breathing to the other side to me, so every stroke we turned our heads to look directly at each other - I'm thankful we both had tinted goggles on looking into his eyes every stroke would have been very freaky, normally only my wife gets this close to me!). I worked hard to swim in a straight line and my GPS plot shows I got it about right. No drifting to the right and heading out to sea for me! I was making an effort to take the time to sight clearly, and only put the power down when I was sure I was oriented correctly. I eventually got bored being in the cluster of swimmers I was in - I couldn't see a route through the middle so I dropped back and overtook them down one side. In retrospect I should have done this earlier - but while I was in there I was enjoying the drafting effect and saving some energy. The nose clip I'd got to stop the sea water flooding up my nose and making me sick was working like a charm. 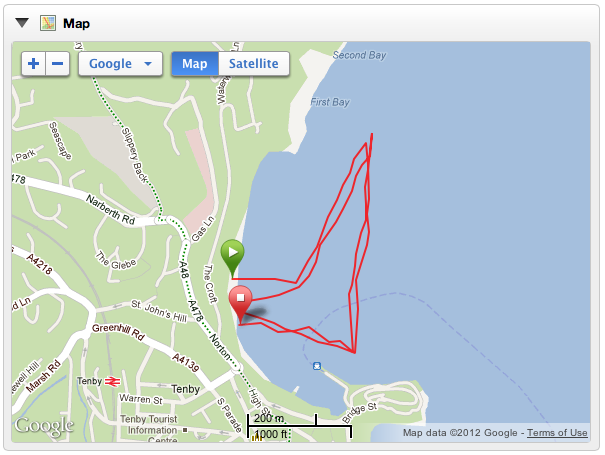 My confidence and comfort in the swim was in no small part due to this. It's now going to be a standard part of my sea-swim kit (mental note: I must add it to the enormous list of things to take to Ironman races). I took the end turn buoy a little wide and needed to correct - it was almost a 180 degree turn and I hadn't quite gone round enough. The return leg was against the current. The waves felt larger in this direction, and I was tossed around a little bit, but still nothing at all concerning. I hope Wales is going to be as calm, but I suspect it won't be. Swim exit was on a rock-free beach - I swam in as close as I could before getting to my feet and setting off for T1. I'd kicked my legs hard for the last 150-200m and they were sturdy and supported me without wobbling. I think back to the first epic (to me) swim I ever did - the Nokia Swim (now the Speedo Open Water series) event in The Thames a few years ago. It was a touch over 2 miles and took me almost an hour and 20 minutes. When I got out I had to be helped to my feet, and then couldn't stand or balance for the next 10 minutes - how times have changed. I remember on that day thinking "How the hell can anyone cycle after swimming this far?". It was a fair trek down the sea front to T1. There was soft green matting down over the road - a lifesaver for me as I have girly feet that don't go bare very often and therefore aren't very good for running on pointy concrete. My jogs from swim to T1 always see me getting overtaken by a lot of people, and today was no exception. This might be an area to work on in the future - particularly for races where there's a long route to transition. This was an amazing swim for me. As I mentioned recently, I'm normally at the back of the first third both in my age group and overall. I don't quite know how I jumped up so far, but I'm really very very pleased with this performance. Looking at the data it's clear my stroke rate fell off quite dramatically - if I can work to keep that up there's another few minutes of improvement for sure. I had aimed in this race to get transitions quick and efficient. I think I did pretty well in T1. I expect my time is slowed by the length of the run - I only took a few moments to deal with my blue bag and get kitted up. I'm not sure I could go much quicker without doing less - shoes on bike and not bothering with socks, for example. This might be worth it in a future 70.3, but for full distance races comfort is going to be far more important than 30s saved in transition. 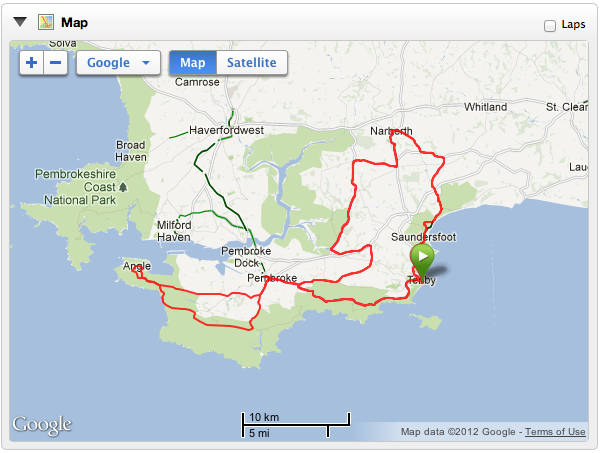 An equally windy route out with the bike to the mount line, and it was time to ride. The bike route was reputedly fast and mainly flat, and it didn't disappoint. 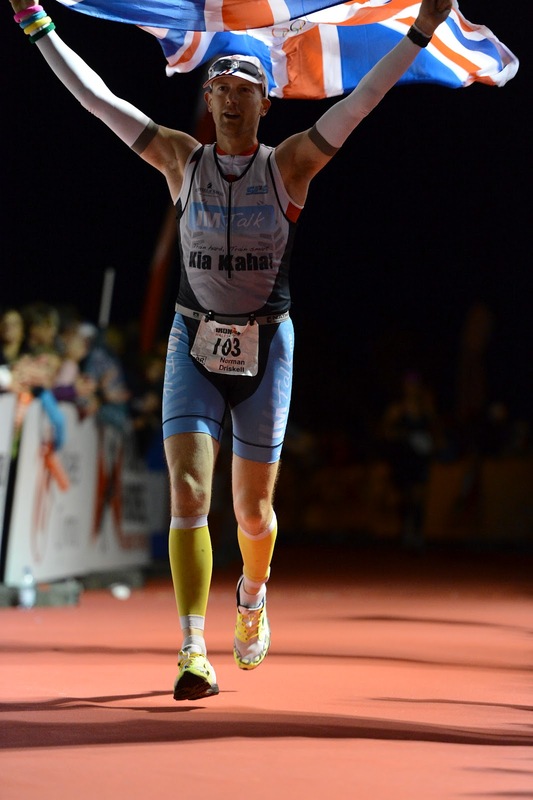 My objective here was clear - to keep my effort under control, and save a lot of energy for the run. This meant keeping my HR down, well within my Zone 1 range (up to 152 BPM) - I was aiming for for 130-135 BPM. As is normal when I first get on the bike, I was up in the 160s. I know from experience that if I relax, focus on breathing smoothly, and don't push a big gear then my HR will drift downwards. It did this over the first 20 minutes or so, and I settled in to my rhythm. 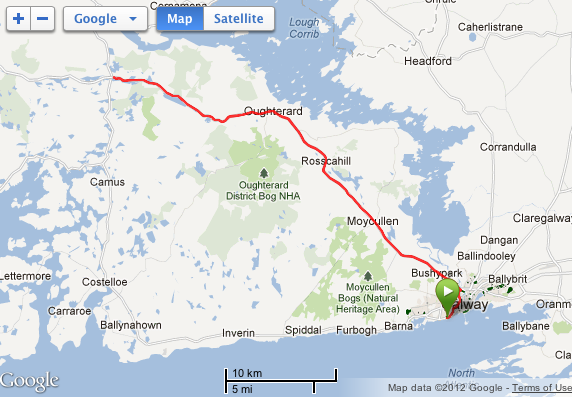 Bike route: 45km out into the countryside, and 45km back again! The bike was fast - really fast. I kept a close eye on my HR and worked hard to not work too hard. On some of the long straights I was a gear lower than I felt I wanted to be, but I needed to preserve strength and energy. I generally only changed up when I needed to get my cadence down and avoid "spinning out" (pedalling so fast you lose form or can't get any power down). It was mentally challenging, particularly when I was getting overtaken (admittedly, that only happened a couple of times), and is certainly something I'm going to need to look at in training. I can really appreciate now how advantageous it would have been to be able to see my power output during this period. To know for sure if I could push it a little bit more, or if I needed to back off. I'll be looking more seriously into this in the future. We'd had a bit of a nutrition error the night before and realised there wasn't enough gatorade mix to go round so our bike bottles had one with gatorade mixed to the correct strength, and one with just water and High5 Zero electrolyte tablets. I really didn't want to have to stop at the aid stations, so I adjusted my nutrition plan from one half-bar and one gel per hour to two half-bars per hour for the outbound leg of the out-and-back course during which I'd drink the electrolyte drink. Once I'd consumed my four half-bars I'd move on to gels, and I'd swap to the gatorade mix for the return leg. This worked perfectly, I didn't feel under-fuelled or fatigued at all. The bike was largely uneventful. I got annoyed at the usual things such as dropped gel wrappers, people riding side-by-side in pairs blocking the road, and the time I was overtaken by a group of 8-10 riders who were clearly all riding in a peloton with no regard for the drafting regulations. I was getting a bit numb in the "undercarriage" by the end and was ready to get off. As it was such a fast and non-technical circuit there was very little movement on the bike - just sat in the aero position pedalling away, therefore any little rubs had plenty of time to get settled in. Mrs has recently got an Adamo saddle that she swears by, so I may try that out before my next long fast aero ride. Flying through Galway back to the transition area I was struck again at the number of people who, with 5km to go, just seem to give up and forget they're in a race, I've seen it at every Ironman so far - just merrily cruising the last few km and chatting to each other. Guys, you're still racing! Get a move on! I swooshed by, wheels humming, arms tucked in. I've got T2 to get to. Their loss! This position in the field reflects my effort management well. I know I could go faster, but at the potential expense of the run. When I'm going flat-out I know I can get into the top 10%, so well-managed effort and heart rate together with a top-quarter finish seems like a good result. 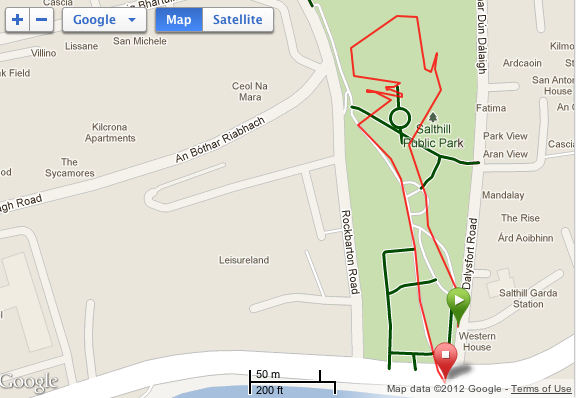 T2: Can you see where I ran the wrong way? Twice? Must spec the route better next time! My plan for T2 was the same as before, fast and efficient. I went the wrong way slightly after racking my bike, and probably could have shaved a few seconds off in the tent, but all things considered it was fast enough. I was soon with running shoes and hat on, and out onto the promenade for the half-marathon distance run. This was where I was hoping to realise the benefit of a well-manged bike phase. I'd avoided looking at my overall elapsed time since start until now. I sneaked a peek and saw three hours and thirty-three minutes. This means I need to break 1:57 for the run in order to come in under 5:30 for the whole event. That sounds like a sensible target at this stage, given I was aiming for sub 2-hours for the run. I decided that 5:30/km was a good pace to set off at, and promptly ran the first km in 5:04 - OK, a little faster than intended, but it felt good. My cadence was high at over 90 steps per minute - this was very good news - at Wimbleball I struggled to get my cadence up (I didn't have a Garmin foot-pod back then so I don't have data, just going on my memory of the experience). The pace was higher than I'd planned but it felt good, like it was something I could sustain. I decided to try and hold at around 5:10/km and see what happened. The run course consisted of three laps up and down the promenade with an aid station at each end. We entered the run course in the middle, next to the finishing area, so unlike Bolton's point-to-point plus 3-laps-but-really-4 (a realisation I found very challenging mentally) this was a genuine honest 3-lap circuit. I held my pace well as the km ticked by. After about 12km the going got a little harder, and I had to make more of an effort to keep my cadence up over 90, but I held it well, and started thinking about when to see if I had anything left to see if I could speed up for the finish. Run cadence: That'll be 5 aid-station stops then. I couldn't have done it any better! At about this point I spotted Mrs coming the other way. She was running a bit awkwardly and holding her arm in the classic way that cyclists do when you see them getting up from a crash with a broken collar bone "I came off my bike", she shouted, "I think I've broken my collar bone!" - I was obviously concerned, but she seemed to be fairly chirpy (or had so much adrenaline in her body she couldn't feel anything), so I pressed on. I decided that when I got my third arm band (one per lap, so everyone knows which lap you're on) I was going to turn it up a bit. That would be with about 4km to go. I would then try turning it up more from the final aid station, about 750m to go. The wind strengthened as I collected my arm band so my efforts went on holding my pace. I checked my time and was just over 5 hours elapsed. I couldn't run 4km in 15 minutes, so 5:15 wasn't on the cards, but I should be able to easily clear 5:30. I did manage to speed up towards the end a little bit, but nothing particularly heroic. This was just the run I was hoping for - even paced, very little fade, enough energy for a little push at the end, and not collapsing over the line. Absolutely bloody spot-on the plan. Run HR: Creeps up, with a lift at the end where I tried to push for victory! The stats speak for themselves, I've never placed this highly in a run of any distance before (in a triathlon or as a single event). I'm absolutely overjoyed - and I know I have more to give here with more training. I crossed the line with a watch time of 5 hours and 23 minutes, and found out later my official finish time was 5:22:35 - that's 52:33 faster than the IM 70.3 PB I had set at my first event earlier in the year at IM 70.3 UK. I didn't have much time to celebrate - I went off to the finishers' area to collect my t-shirt and food and drink (tea! They had tea! Wonderful), before heading back to the run course to catch up with Mrs. She looked to be running well and we agreed to meet at the medical tent. I have to point out here that the medical staff and the marshals were wonderfully helpful and considerate, they all showed genuine concern for her well-being. A trip to A&E revealed she had broken her collar bone in two places, having had a pretty major bike crash about 10km out. In T2 she insisted on going out for the run anyway and finishing the race - amazing resolve and strength, mentally and physically. I'm in awe of her determination. In summary, this was the best managed race I've ever completed. I stuck to the plan closely, but with enough flexibility to adapt to the day. My pacing and effort was almost ruler-flat for the bike and run - suggesting I could have pushed harder. Most importantly, I didn't die in the run - I didn't see my HR sky rocket (or drop to a point where I couldn't load it properly), my cadence didn't fall off appreciably, and I didn't get too fatigued or hungry. This was just the right time for this race to come off well, and gives me good confidence for Wales - at least that I'll get to the end, even if I don't set any PBs along the way. One race left, 2 weeks to go - bring it on!